"The Proms" is a multi-artist event that combines classical music with today's brightest popular music. It's become a great way to introduce classical music to the masses, while at the same time letting rock bands showcase with an orchestra backing them. The headliner this year was Simple Minds. 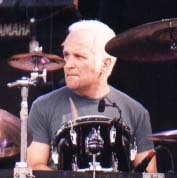 Alan and the band appeared at multiple shows, playing three songs ("Eye In The Sky", "Old And Wise" and "Brother Up In Heaven"), as well as appearing in the finale. Other artists that performed included Debbie Harry (aka Blondie) and John Miles.